We mention several times throughout our website that our dogs and our puppies are part of our family. We have even had people who come to see us tell us that our pets live as good or better than most people. We like it that way and plan to continue to treat our pets with love and care. We hope you will too when you get your new puppy. You can be assured that your new puppy will come to you feeling like a loved, cared for member of the family. Your new loving home will just be an extension of what they have known since they were born. Our facility is clean and well kept, and as a breeder our adult dogs are bathed,groomed and yearly health checked. We are proud of our facility and we know that you will be very impressed with our set up. Below you will see pictures of our Love Nest where it all starts, our Grooming Room which is used often, our Home and several nurseries. Let me tell you a little bit about our procedures that we do here and about our nurseries and crate training. As you will notice that all of the nurseries are clean ,yes it is clean all the time ,not just to take pictures for you to see.We work very hard to keep everything clean and in order, The puppies are born in our home then when the pups are about 4 to 5 weeks old we move them in a nursery they are never confined for long periods of time. When the pups are about 4 to 5 weeks old we teach them to go potty outside. That is why are puppies are easy to house train. Inside our crate training room you will see crates. 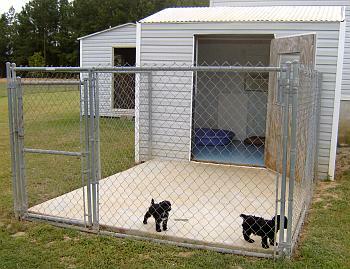 That is where we crate train our pups. All of our crates are bleached daily that includes the grid which is what the puppy stands on in the crate everything falls to to slide out tray in the bottom which we use newspaper and the tray is also cleaned daily and bleached often as needed. In each crate you will see a soft bed which is washed when needed, a feed bowl and a fresh water bowl. All of our crates have plenty of room for the pups to play and a nice soft bed for them to sleep on. We do let them out several times a day they are not confined for long periods of time and as they get older we let them stay out longer then when they want to take a nap they will go and get in their crate. When it gets time for them to go to bed at night they will go on to sleep and don't cry all night when we get up in the morning we let them out to go and potty on the patio. Each one of our nurseries and patio are cleaned and moped daily with bleach. I had just sold a dog to a lady that has a older dog and she couldn't believe that her new puppy at only 7 weeks of age would go to the door wanting out to potty she said her other older dog don't even do that. Our customers really like the way we crate train and start potty training our puppies. We have also started training our pups to use a Doggie Door that is when we have on the air condition or heater so they can go and potty without us opening the door, but in the morning we always use the front door because we don't want to confuse the puppies they use the doogie door their self. We are not just dog breeders, we love our adult dogs and our puppies that we raise it is so funny to watch them play with one another they will bring you so much joy into your life you would wonder how your life would be without one of our precious pups. We strive to give you the very best puppy possible and we also work closely with our vet to insure that all puppies are in excellent health to the best of our knowledge. Our pets and our puppies do come in to our home but they also have their own personal "estate" on our ranch. We have just remodeled our big nursery below you will fine picture before and after. We think our adult dogs and our puppies deserve the best. I will be taking pictures of the outside when we get the steps done and I also have another nursery that I use along with my grooming room we will be remodeling that nursery in a couple of weeks. This is where it all starts. You might call it a breeding room but as you can see our dogs are very comfortable in their Love Nest! 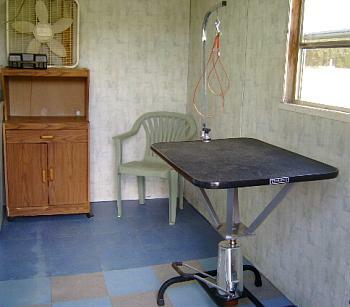 The grooming room is an important part of our care center. 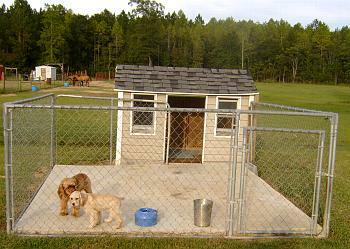 It's well ventilated and equipped with everything we need to keep our dogs and puppies clean and well groomed. It gets used often. 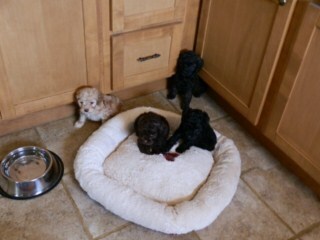 Here you can see the set up we have provided for a litter of puppies in our home. All of our puppies are kept in the house with us when they are first born. That way we can keep an eye on them and their Mom. Then we move them out to the Nursery or the Crate Training Suite. This is the stand alone nursery. You can see our happy puppies playing on the patio. This picture here is when you walk in the the new suite. We painted the suite and had ceramic tile put down. This is the left wall where I have my calendar so i can kept my schedule of worming and medical attention for each litter of puppies. Fresh air and sunlight is important for healthy puppies. This is our crates they are equipped to be comfortable, clean and airy. Each litter of pups has a real soft comfy bed, fresh water, food and have toys for them to play with in each crate that is being used. We want our moms and puppies to feel safe and comfy. The puppies love to get out and play and lay on the ceramic tile floor where it is cool in the summer. When they get ready for a nap they will go back and get in their crate and take a little nap. We keep a window style air conditioning unit ready to go for our warm weather babies. In the winter when it is cold we run a heater and heat lamps. We make sure that our puppies are living in an appropriate temperature for their age and current season. 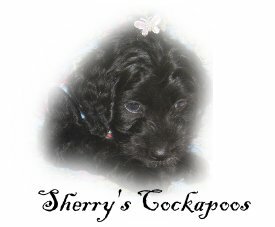 If you are considering buying a puppy from us please visit our Testimonies and Comments page from families that have already purchase a puppy and to see what they have to say about our cockapoo puppies and the care we give them. If you would like to be placed on our Waiting List, check out our waiting list and our Up Coming Litters pages for our procedures. Amanda at 229-457-4658, 229-423-8158 or 229-457-4545 and we will answer any questions that you have. Their is no charge for meeting you the Saturday when the puppies are ready to go and that we only make one free trip per location.